The relationship between a retired investor and their financial advisor often starts when the investor is still working. In fact, a majority of working investors believe their financial advisor relationship should last through retirement to the end of time. There is an advantage to advisors connecting with a working investor enough to continue the relationship through retirement. The reasons are many, and make so much sense it questions why advisors don’t consider the benefits of such long-term relationships. Spectrem’s study Advisor Relationships and Changing Advice Requirements studies the details of the investor-advisor relationship and determines how investors think differently about their advisor based on age, wealth level and occupation. It also offers a look at how retired investors think differently about their advisor than do investors who are still in the working world. 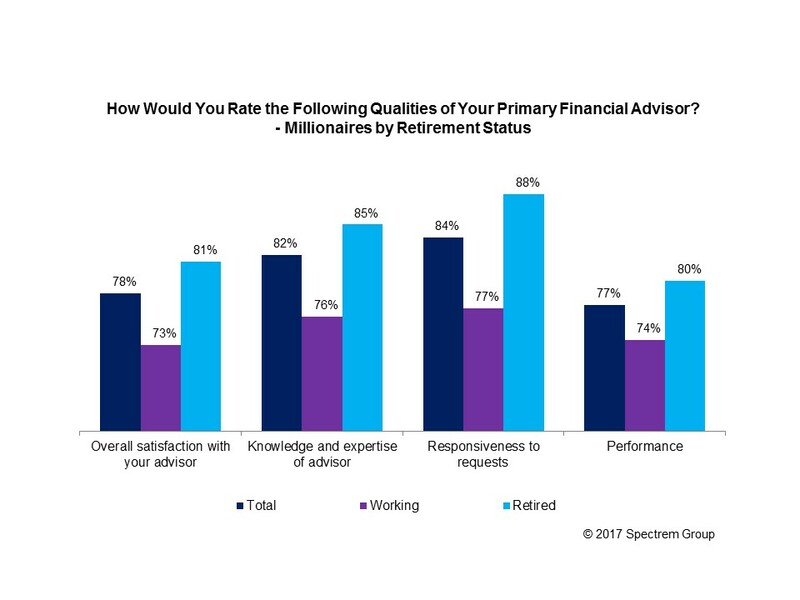 · Retired investors are more likely to use an advisor than working investors do (74 percent to 69 percent among Millionaire investors with a net worth between $1 million and $5 million). That’s an indication that, somewhere along the line, a working investor realizes they are approaching retirement and do not know what that means for their financial future. Finding investors who are approaching retirement and not using an advisor might be a trick, but it is one worth pursuing. · Retired investors do not change advisors. At the same time, retired investors who do not use advisors do not suddenly decide to do so (and that is especially true of the wealthier retired investors). The only reason a retired investor might begin using a financial advisor after entering retirement without one would be if they suddenly received a windfall of cash, and that is not a likely outcome. For advisors, know that a relationship with a retired investor is likely to be a part of your client list for as long as either of you shall live. · Retired investors are generally more satisfied than working investors. Again, this is often as a result of a long-term relationship that has worked out for both parties. · Retired investors are more dependent upon their advisor than are working investors, and that is more true when the investors are less wealthy. Those in the Mass Affluent (net worth under $1 million not including primary residence) and Millionaires (up to $5 million in net worth) are more likely to require a high level of assistance on investing. · Finally, retired investors are far more likely to refer their advisor to others, and are far more likely to have already done so. Almost 60 percent of retired Millionaire investors have already referred their advisor to somebody else. Advisors often look to young investors who are occasionally more aggressive and active investors. A young investor who makes wise investment decisions is likely to become a wealthy middle-aged investor looking for even more advice than when they were young. But retired investors have benefits to a firm’s success. Retired investors are more loyal, more satisfied, and more likely to promote your services to others. With retirement lasting upwards of 20 years for some investors these days, advisors would be wise to consider their retired clients with the same fervor they apply to the younger working clients. All of your clients who currently have jobs are going to become retired investors someday, and there is obviously a transition period that takes place from the perspectives of an employed investor to those of a retired one. Any client who has not completed a full appraisal of their retirement plans needs to be reminded of the need to do that at least once annually, because you never know when the investor will be ready to convert into the post-work mindset. The other caution for advisors is to maintain a strong regard for the needs of retired investors. While they may not be as active or profitable as younger employed investors, they still have needs. They have families who will one day need an advisor, and they have an estate that will require dispatch at some point. These are all issues you can contribute advice to over time.